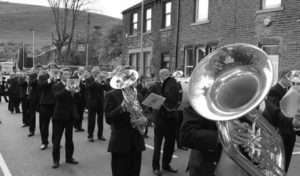 The Wakefield Metropolitan Band was first established in 1977, under the auspices of the Wakefield Metropolitan District Council Education Committee, from members of the then Wakefield Metropolitan Schools Band who had become too old to play in nationally graded Contests. The Band entered the fourth section in 1978, quickly gaining promotion over the years to the second section under the baton of Musical Director Les Heppleston. It was in the National Finals of 1987 that the band gained the title of ‘Champion Band of Great Britain-Second Section’ which resulted in promotion to the first section or what is now called the Championship Section. During this period the band enjoyed mixed fortunes including four years in the Championship Section from 2010 -2013, a win in the Senior Trophy in 2012 and most recently becoming the Yorkshire Second Section Champions 2017 under the baton of former Principal Cornet Richard Larder. Since its formation in 1977 the band has performed many concerts each year including the ‘Bands in the Parks’ series throughout Yorkshire, at agricultural shows, charity fund-raising events and the ‘sell-out’ Christmas Brass concert each year at Wakefield’s Theatre Royal & Opera House. The band regularly takes part in joint concerts with local choirs and also has a popular 10 piece group which is available on request. The band’s repertoire is wide ranging; from swing, rock and ‘modern pop’ to extracts from the Musicals, Operas and Classical including items composed or arranged by members of the band in addition to the more traditional brass band repertoire. Over the years the Band has performed on radio and television on a number of occasions, toured France and made some twelve visits to Germany. We have also had the privilege of playing before members of the Royal Family. Several album recordings have been made and the latest CD is NOW available. From time to time the band is invited to perform on local TV and radio programmes. Contesting is also important in the life of the band, with some notable successes over the years. Following a steady rise through the ranking system the band won the Yorkshire Area 1st Section in 2009 and was promoted to the Championship Section where it held its own alongside some of the most famous bands in the world.